What a wonderful crew of snowshoers we had out at the Frisco Nordic Center for Snowshoe for the Cure 2019! We could not be prouder to partner with this community of folks who remain committed to stomping out breast cancer! At Susan G. Komen Colorado, we realize just how bold our goal is – to reduce breast cancer deaths by 50% in 2026! We remain empowered each day toward that goal because of folks like YOU! If you strapped on your snowshoes and stomped out breast cancer this year, please peruse some great photos, courtesy of our photographers – Bill Linfield and Collins Photography of Summit County. If you weren’t able to join us, we wanted to offer a few stories that help to illustrate the impact we can have. 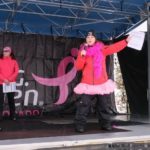 What’s clear to the team at Komen Colorado, is that this year’s Snowshoe for the Cure left its mark in the critical fight against breast cancer! To date, we have raised close to $40,000 and are so dang close to our goal of $50,000! For anyone who might be interested, we are keeping the window for Snowshoe For the Cure donation dollars open through March 31. We encourage anyone who hasn’t done so to go ahead and visit HERE to add a donation and help push us meet our bold goal. OR copy this link into your Facebook page and encourage your friends to join us in the fight! We need your help to create a world with more survivors, fewer barriers to early screening and more cures born of critical research. We like this event because it is so signature, Colorado! (See photo for amazing backdrop of the Rocky Mountains!) But what we LOVE about this event is the relationships we get to foster with in the process. 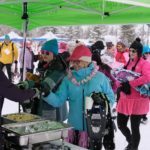 For those that don’t know, Snowshoe For The Cure is more than just a one day event, we actually kick it off with a PINK PARTY hosted by the Town of Frisco at the Summit County Community and Senior Center on Friday night. Can we just say that the Team at the Town of Frisco cannot be beat! 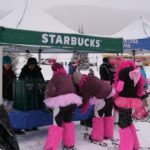 The Pink Party is a great way to start our weekend as snowshoers pick up bibs, T-shirts, goodie bags, and enjoy a chance to connect with old friends, peruse merchandise from our sponsors, and catch up with teammates and survivors alike. This year’s weather presented some challenges, but nothing that our dear friends at the Rio Grande Mexican Restaurant couldn’t handle! They responded to our needs (for a hot breakfast) and helped us call an audible that morning and the results were felt in our bellies… bellies warmed with Rio breakfast burritos, of course! Additional thanks are due to our other sponsors including Starbucks for the coffee and cocoa! Operation #hotstuff was in full swing as temperatures were in the chilly neighborhood of the 20’s, but snowshoers couldn’t notice, thank to our dear friend Lauren Hitchell, from Studio B, who led us in some warm up activities before we sent our Lil Stompers off for the day’s first race! Thank goodness for those adorable Lil’ Stompers and the service they provided with a very welcome cuteness fix! After sending off a certainly motivated crew of snowshoers, our ceremonies closed with live cheers for finishers and colorful commentary from Colorado’s best, Paula Haddock. Komen Colorado is committed to survivors, dedicating funding to research, care, community and action, we believe we can create a world with more survivors! Along the way, we promise to celebrate these survivors and raise their voices up!